We are leaving the Allegheny to look at bridges crossing the Monongahela River in Pittsburgh, Pennsylvania. When I first saw this bridge, I thought it was some kind of arch bridge, but its actually a lenticular truss, which was invented by the 19th century engineer Isabard Kingdom Brunel. He used this design for the Royal Albert Railway Bridge between Devon and Cornwall in England. Like that bridge, the Smithfield Street Bridge has an upper (arch-shaped) compression member and a lower (suspension-shaped) tension member. Since the bridge doesn't rely on the substructure to resist the compressive forces, it can be built on the ground before being lifted into place. The lenticular (lens-shaped) truss carries the deck along its span to the pier at each end. The Royal Albert Bridge has huge tubular compression members. The compression member's cross-section on the Smithfield Street Bridge looks about the same size as the tension members' cross-section. Still, the Smithfield Street Bridge has been supporting itself and various live loads since 1883, so it must be working. It was designed by another famous bridge engineer, Gustav Lindenthal who created the Hell Gate Arch Bridge in New York City. This was the third bridge to be built at this site. The covered Monongahela Bridge was built in 1818 but it was destroyed by a fire. 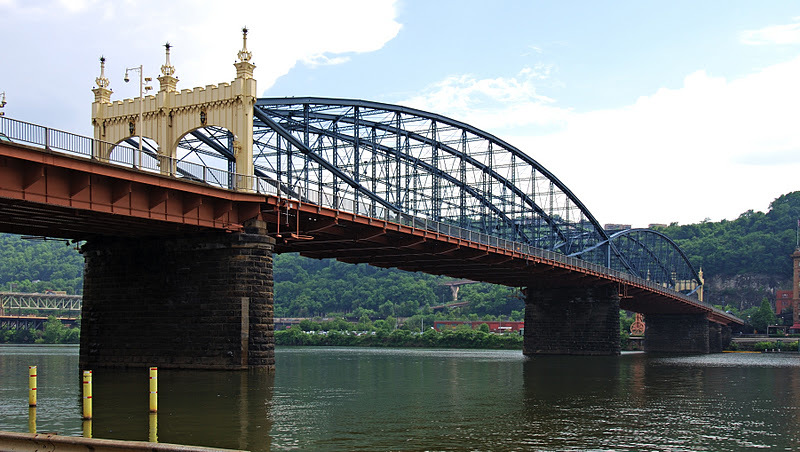 John Roebling designed a suspension bridge at this site in 1845, but the increasing live loads were causing excessive deflections and so it was replaced by the current bridge. Pittsburgh's Bridges: Smithfield Street Bridge (1) by Mark Yashinsky is licensed under a Creative Commons Attribution-NonCommercial-ShareAlike 3.0 United States License.